My husband’s family is known for working hard, but they also play hard. Summer time is a great time to sit out on the patio or deck, enjoy the warm evenings, and have a glass of wine with your spouse, family and friends. These Work Like a Captain Stemless Wine Glasses are perfect for warm summer nights. I love the look of traditional looking wine glasses, however, they are not always practical. Stemless Wine glasses allow you to cradle the glass in your hands and are perfect for parties or wine tastings! At only 4.625 inches tall, you do not need to worry about these wine glasses being too tall, tipping over and spilling your beverage. Use these stemless wine glasses for highballs and other mixed drinks if wine is not your favorite beverage. 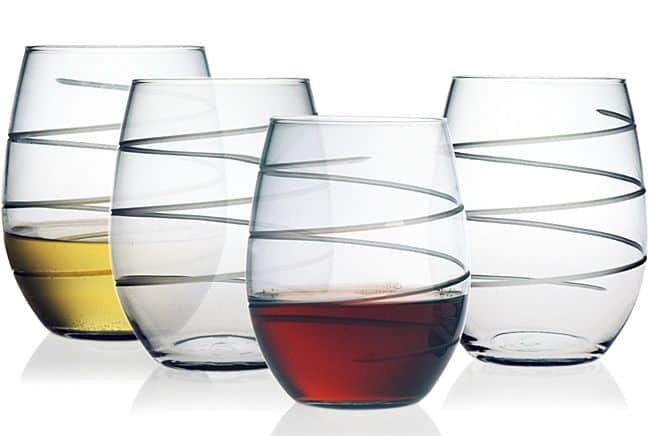 Or if you are in need of individual capsles for desserts or appetizers, these stemless wine glasses would make a great statement. Check out other great stemless wine glass designs (even personlized ones!) at O.co. 1 CANADIAN Mommy Moment reader will WIN a set of Work Like a Captain Stemless Wine Glasses valued at $58! To enter, leave a blog post comment what you would use these stemless wine glasses for. I would use them to drink wine. That is my drink of choice. I’d use them daily at dinner. I would love to give these as a gift to my pirate loving, wine drinking friend. I would use them daily to drink water. I would use it for my sangria! We would use these at dinner. I would also use them to serve dessert in. A layered pudding , cake, whip cream and berry dessert would look extra nice in these. These are very nice and would be great to sip my wine out on the deck enjoying the quiet evening!! I’d use them for wine, of course! I’d use them for guests who drink wine at any occasion! I would use it while after our get together this summer. Sparkling flavored water would go nice in these beauties. I would use them in the evening with my Rye. I like the glasses with the swirls-the pirate saying not so much-I would use theses day to day for juice, milk, water etc. I too find the traditional wine glasses quite inconvenient sometimes. I like to wind down after a long day by enjoying a class of wine and watching netflix (sometimes in bed too) so I usually don’t like to be bothered with the long stem glasses, so these stemless glasses would be perfect for that! Thanks for the chance! I would gift these to my son who loved playing pirate as a child. I would use them for family dinners!! Love them! We would use them for our homemade wine! Would love this for the last camping trip of the summer ! I would either give them to brother because he thinks he’s a pirate) or I would use them myself to drink Sangria! I would use these for every weekends glass of wine as a reminder to work hard. REd Red Wine. Love them! These will be perfect for my friend and dining and drinking on her patio. I would use them for wine. I would use them for drinking wine with friends. I’d also use them for juice. These would be great for our upcoming back yard dinner party! I would give these to my mom. I’m not a wine drinker. I would use them for everyday use and replace the incomplete set I have now. They are beautiful and I would use them to drink wine! I would love to use these for my wine. I would use them when i entertain. I don’t drink, so I would use them for desserts! I’d use them for wine. I would used them for serving and enjoying wine – i love the gentle gracefulness of not having a stemmed glass and being able to cradle the wine glass in the palm of my hand. So earthy and romantic. I would use these glasses for wine and some fancy mixed drinks. I would give these wine glasses to you daughter because they just love wine and they would really appreciate them! Anything really. OJ in the morning, to a nice Kahlua on the rocks for later. These would make a great wedding or anniversary present for any romantic couple. For evenings with the girls . These would be perfect for celebrating the different holidays at our home. I’d use these glasses for wine. I would use these gorgeous glasses for girls nights! They’re lovely! I just made my first batch of wine and would love a stemless glass. I’d use them for wine & cocktails! I would use these stemless wine glasses for red wine. I would use them to drink wine. I would use these when my sister comes to visit. She’s the wine drinker. I’d use them for wine especially for my three Christmas parties. I would use them daily as a water glass. I would use these glasses for lemonade on ice! I would use these wine glasses to drink my wine with my girl friends after being pregnant!!!! I’d use them for wine and other beverages on the patio and deck. i would use these glasses for a theme party. pirate theme etc. I can just picture a nice glass of super chilled Reisling in these glasses. I would use them to drink some type of white wine. I would use them at Christmas time. Eggnog and wine. To celebrate the plunder and pillage over the weekend. I”d use them for outdoor summer parties! White wine with my get-togethers with my girlfriends. I would use these glasses when my girlfriends gather at my home when it is my turn to entertain. I’d probably use them for home-made sangria. Would be drinking my favorite local mead from them. these would be great – i’d use them to drink from instead of straight from the bottle! I would use them for drinking wine with friends so we will all have the same set of glasses. I would use them to drink wine daily. I need these for my husband who tends to knock over the tall wine glasses. We love drinking wine. I would win these for my bf and I since we’ve broken most of ours. Cab Sav – mommy time! I’d use them for my random evening glasses of wine! I would drink them with the Captain himself, mmm, rum, thanks. I would use them to drink wine, of course. these would be great to use when it is just the 2 of us, or when we were entertaining. My best friend has a set and I love hers! I’d use these for entertaining. I would use them for red wine on my deck. I would use them for the wine I just brought back from Portugal. I would use them for everyday use, no such thing as special occasion in my house, every day is one . They would go great with my homeade vino! I would use them for drinking wine with family and friends. Perfect for drinks on my friend’s patio. I LOVE these glasses. they are excellent. I’d either use them for when I have company over or I’d gift them to my girlfriend because I know she’d like them just as much! I’d use them at dinner for wine! I would use them for wine when my mother in law visits! I would use them for wine of course! Mostly white wines- their our favorite. I would use them for wine. Coincidentally, a friend of mine has pirate parties and these would be perfect. I would use them for girls night. I would love to win these to use at my next wine and cheese party! 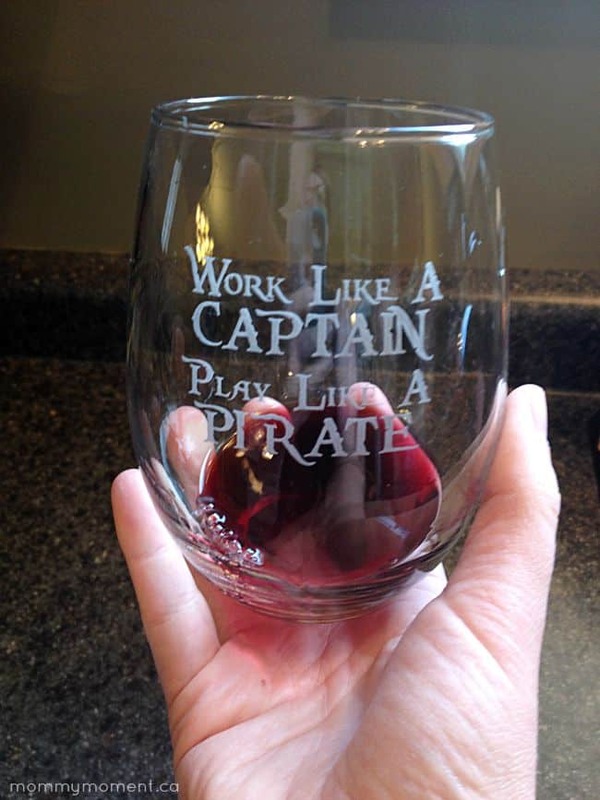 I Would use these wine glasses for when my family & friend get together….because everyone wants to play like a Pirate!!! I’d use these lovely glasses every day(for my wine)! Like the look of these without stems. More solid looking. I would use them all the time for my wine and hopefully I wouldn’t spill so much!! Girls Night!! I love these by the way!